Exercise is an essential aspect of life. Without it, we may find ourselves feeling cranky and stiff whether we’re 24 or 84. However, if you’re living with illness or disability, then you may not feel like exercise is for you. This couldn’t be farther from the truth. There are a safe, gentle ways to exercise and we’re going to discuss some of them today. Before attempting any kind of exercise, you should always consult with a healthcare professional to make sure that you won’t endanger your health. A doctor or nurse may even be able to give you advice based on your specific needs and ailments as well, so don’t hesitate to reach out. Additionally, you should always start gently when engaging in any kind of exercise. Give yourself realistic goals and work towards them at a pace that makes sense for you today, not ten years ago. All progress is progress, so if you’re only able to meet half of your goal, then you’ve done well. What matters is that you’re doing it, not that you’re doing everything. The best places to start are the places where you feel some of your worst pain. For example, if you have stiffness of the neck, which is common for many people, then you may want to start with gently moving your head in a circle, pressing your ears towards your shoulders as far as it is comfortable. Then move to your shoulders and press them forward and back slowly, letting the muscles reach and stretch. As you reach and stretch with the various parts of your body, imagine reaching beyond the end of your limb for a deeper stretch. If you’re not breathing, you’re not living, so make sure to maintain your breath. Start off your session of stretching or cardio by getting in touch with your breath. Spend a few minutes just breathing and feeling your body expand as you breathe in. Feel the tension slip away as you breathe out. The stronger your connection to your breath is, the better your exercise will feel. 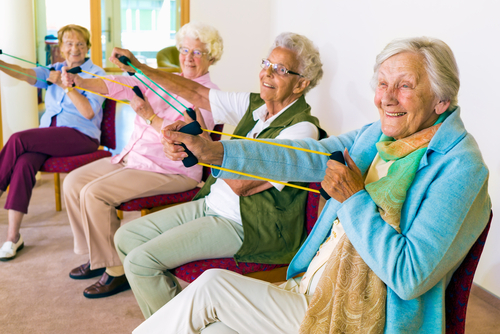 If you are looking for an assisted living facility that you can call home, then you’ve come to the right place. Here at Kenwood Care, we offer a comprehensive living experience where you or your loved one cal call home. Contact us today for more information and to ask us any questions that you may have.